High above, in 3.029 metres above sea level and directly at the border to the Hohe Tauern National Park, you can feel alpine nature with all your senses. 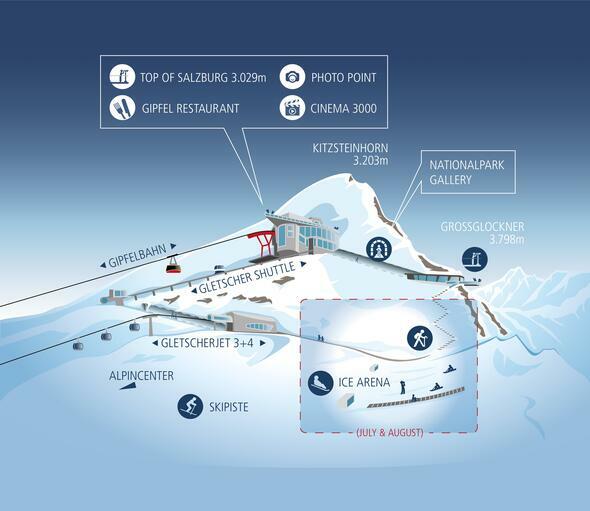 An alpine experience, which is usually reserved for experienced alpinists on their mountain tours, turns into a leisurely excursion at the Kitzsteinhorn in 3.000 metres above sea level. Reached easily with the comfortable cable cars, the Gipfelwelt 3000 is a popular excursion destination all year round. The view from the viewing platforms "Top of Salzburg“ and "National Park Gallery“ is marvellous. The glaciated peaks of the Hohe Tauern National Park glisten in the sunshine and Austria's highest mountain, the Grossglockner, peeks at eye level through the clouds. Austria's mightiest mountains are at your fingertips here. You can experience the glacier close up on a summerly slide in the Ice Arena below the peak. National Park Ranger take you on a guided tour through the Gipfelwelt 3000 and provide interesting details about the Hohe Tauern and the Kitzsteinhorn. Lunch break at Salzburg's highest-situated restaurant. Accessible by glacier shuttle starting from the summit station.